From the moment you wake to a stunning sunrise over the lake to long after the light fades behind the Adirondack foothills, every day on Lake George is a beautiful adventure (even the rainy ones)! Discover everything there is to love about Lake George, NY - from the lake’s natural beauty to the exciting attractions and events in town, we promise there's something everyone will fall for in Lake George. Nothing says summer quite like sun, sand, and surf. 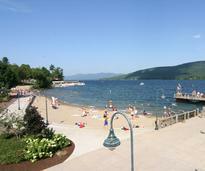 Visit one of several public beaches on Lake George to lounge in the sand and swim in the “Queen of American Lakes” under the supervision of trained life guards. With these fun indoor activities, you and your kids will be hoping it rains! Put your shades away and grab your umbrella because you’re going to want to explore all Lake George has to offer in the rain. Not July 4th? Not a problem! 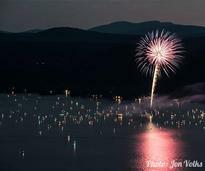 Lake George and the surrounding area frequently celebrates with fireworks displays during the summer. Check out our guide to the best shows and spots to watch. From beaches to nature centers, museums to amusement parks - Lake George has everything you could possibly need to keep you and your family entertained during vacation. In the beautiful Adirondacks, Lake George is the perfect gateway to stunning hikes. Whether you’re looking to summit or go on a family-friendly nature walk, there’s a hike for everyone. With choices ranging from tent sites to cabins to RV-parks, you can rough it or take advantage of being just minutes from some of the Lake George Region's best restaurants and activities. 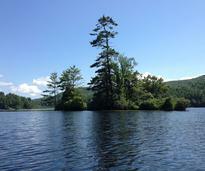 Ditch the mainland - go camping on an island in the middle of Lake George. Accessible only via boat, kayak, canoe, or paddleboard, pack light and enjoy stunning 360-views of the lake and surrounding mountains. The best way to experience the lake is to be out on it. Whether you’re in a pontoon boat, runabout, or canoe, you’re guaranteed to have the best views of the lake from a boat. Not bringing your own? There are rentals! 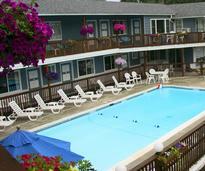 Yes, you can enjoy Lake George on a budget! We break down budget-friendly lodging options, dining options, and free (or nearly free) things to do. One of the East Coast’s biggest motorcycle rallies, Americade features a full week of bike-related events. Thousands of bikers flock to Lake George to enjoy the winding roads and non-stop action. 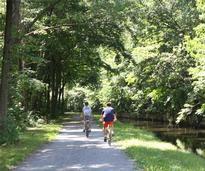 The Lake George area is an excellent destination for cycling enthusiasts and amateurs. With trails of varying difficulty and plenty of bike shops, you’ll love the stunning views as you cruise around the lake. 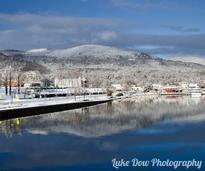 Right next door to Lake George is the small town of Lake Luzerne where tons of new adventures await you. Enjoy paddling around the lake, local horseback riding, tubing trips, and more. 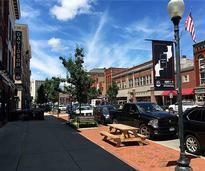 There is plenty to do and enjoy in the nearby city of Glens Falls. Visit a museum, take a walk on the art trail, grab a delicious bite to eat, listen to live music, stretch your legs in a beautiful park, and more. 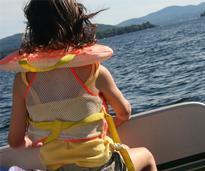 The fun in Lake George doesn’t stop after Labor Day! With fall colors, apple picking, perfect hiking weather, and more, you might just enjoy the autumn more than the height of summer. Have you ever seen snow fall on a lake? Do you wonder if lakes freeze? Head to Lake George for spectacular winter fun and access to all the best skiing, snowshoeing, and hot chocolate sipping in the ADKs. Who says winter is for sitting at home? With chili cookoffs, dog sled rides, and even golf tournaments, the Lake George Winter Carnival dares you to enjoy winter every weekend in February.